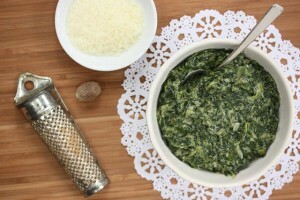 Creamed spinach is one of those side dishes that’s been around for a long time. Surprisingly, even though it’s spinach, kids really love it. We love it too but aren't too fond of all the cream and butter called for in most recipes. That’s why we gave it a makeover … keeping it in line with today’s tastes and nutritional priorities! Speaking of kids, Liz's son, Simon, has declared this recipe his hands-down new favorite. His exact words … “it’s mad good.” That’s pretty high praise from a young teenager, don’t you think? We sure hope your kids love it as much as Simon does! SPECIAL OFFER: SchoolFamily.com readers can purchase No Whine With Dinner at 30 percent off the list price, and get free shipping, by ordering the book here and using this promo code: FS2011. Cook the spinach according to package directions. Once cooked, drain in a colander, and press with the back of a large spoon to remove excess moisture. Set aside. Heat 1 tablespoon of the oil in a medium saucepan over medium heat. Add the onion and cook, stirring frequently, until softened, about 5 minutes. Add the remaining 2 tablespoons of olive oil and the flour and whisk constantly until the mixture is smooth and golden, about 2 minutes. Whisk the milk, salt, pepper, and nutmeg slowly into the flour mixture. Raise the heat and bring to a low boil, stirring constantly. Reduce the heat and continue to simmer and stir gently until the mixture thickens, about 3 minutes. Turn off the heat and whisk in the Parmesan cheese and cream cheese until the cream cheese melts. Stir in the cooked spinach, and season with additional salt, pepper, and nutmeg to taste. Place over low heat and reheat if necessary.